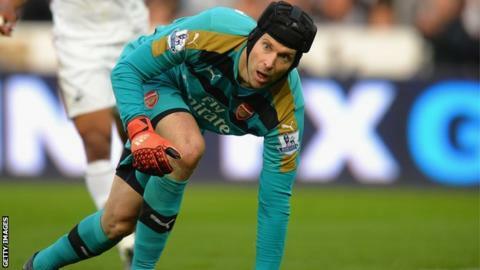 Petr Cech is "one of the greatest goalkeepers English football has seen", believes Arsenal manager Arsene Wenger. Cech, 33, joined the Gunners from Chelsea for £10m in June and has had eight clean sheets, including three in his last four league games. He has also kept out 84% of shots on target - the highest figure of any top-flight goalkeeper. "He is gifted with a super talent," said Wenger, whose side face Tottenham on Sunday. "It is not just class - it is dedication and consistency of quality. He is absolutely dedicated to his job. Petr Cech and Tottenham's Hugo Lloris have repelled a higher percentage of shots on target than any other PremierLeague goalkeepers, with 84 and 83% respectively. The top-flight average is 71%. Cech and Lloris are likely to face either each in Sunday's north London derby. "He is one of the greatest goalkeepers you have ever seen in this country." The Czech Republic goalkeeper endured a difficult Premier League debut for Arsenal, misjudging a cross to allow Cheikhou Kouyate to score West Ham's opener in a 2-0 win at Emirates Stadium in August. But he has become a key part in an Arsenal defence that has conceded only eight goals in the top flight this season - the joint-lowest total in the league - and his absence was sorely felt when David Ospina deputised in Champions League defeats to Dinamo Zagreb and Olympiakos. Cech holds the record for Premier League clean sheets, having surpassed former Liverpool, Portsmouth and Manchester City stopper David James's total of 169 in October's 3-0 win over Manchester United. After 11 seasons with Chelsea following his arrival from French side Rennes in July 2004, Cech now has 172 top-flight clean sheets and Wenger backed him to continue for another five years at the top level. "He plays in a position where age is less of a restriction than in any other job," said the Frenchman. Who will be MotoGP champion? Read more on MotoGP season finale: Who will be champion in Valencia?